ALEXANDER POVETKIN: "I AM READY TO DEFEND MY BELT AGAINST EVERY CHALLENGER"
WBA Heavyweight Champion Alexander Povetkin (22-0, 16 KOs) has laughed off the comments from Tyson Fury (16-0, 11 KOs), who most recently claimed he was ready to "take Povetkin out." The 32-year-old Russian makes a first defence of his title at Helsinki´s renowned Hartwall Areena on December 3, taking on tough American challenger Cedric Boswell (35-1, 26 KOs). 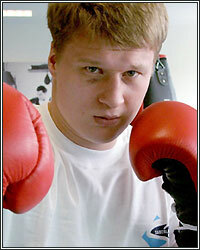 Povetkin was amused by Fury´s remarks. "I am ready to defend my belt against every challenger out there," he stated. "But I must admit I am not overly scared by comments from someone whose biggest hit to date has been a Youtube video where he punches himself in the face. Right now all my focus is on Cedric Boswell." Promoter Kalle Sauerland added: "We would love to make that fight and I had offered them the December date but they didn't seem to fancy it too much so perhaps now we can discuss next spring. First Alexander needs to take care of a very tough challenger in Cedric Boswell."